Search review & compare local North Hills drums teachers. Start lessons today! 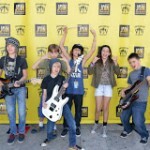 Getting quality drum lessons in North Hills on both a budget and time crunch is easy with the help of Lessonrating.com. Regardless of your level of skill with the drums, there's a local instructor just for you. It's merely a matter of comparing profiles and finding the drum teacher that works for you. Instructor profiles on Lessonrating.com feature pictures and detailed information necessary to make an educated choice in drum tutor. You'll know where in North Hills, California the drum teachers you're looking at are based, or where they're willing to travel to you. You'll see their hours of availability and ratings submitted by former students. Instructor profiles are also a place for teachers to talk about themselves and open up about their passion and approach to their drum lessons. Lessonrating.com is the simple, smart path to finding a drum instructor in North Hills with the skills, reputation, and schedule that fits you best. Lessonrating.com is part of your journey to mastering the drums. Calling all North Hills Drums Teachers!